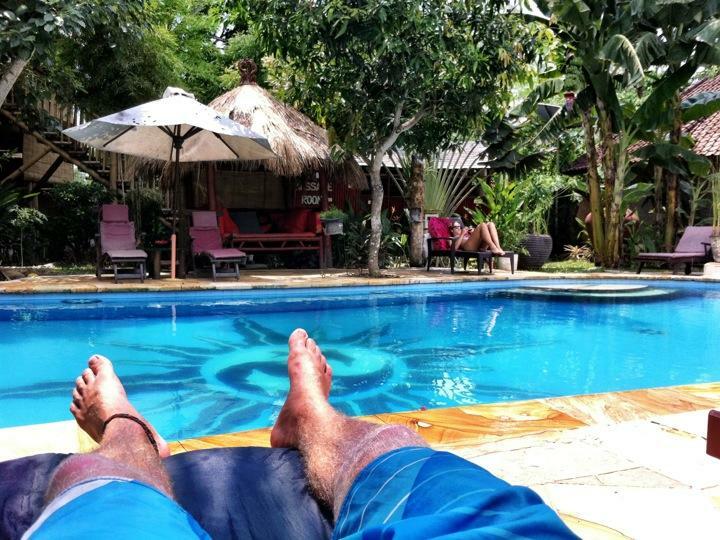 So today was my 2nd full day in Bali, and 1st without a ridiculous hangover. I was first up again about 7am, and was just having breakfast (same as yesterday) when Saskia and Georgie got up. Saskia was Skyping or something, so Georgie, another guy we met called Tom and myself went to Echo Beach for a surf. The swell was about half the size today, but the reefs were still a good size on sets. In the end we opted to surf a left hand reef out the front of a cafe built right up to the waters edge. It was crowed (as seems to be standard for Bali as I expected) but I got some really fun ones. I was also crashed clean into by some crazy woman and had my legs swipped out whilst on a half decent wave, which I was not impressed by, not least as being stuck in the impact zone on a relatively shallow reef with a solid set coming in was far from the ideal situation. Having had a good surf I came back, and had the chicken curry for lunch, whilst sat in the sun, by the pool (hard life!). It had been bright sunshine and hot all morning, but about 12-1 a big thunderstorm kicked off, and caused some extremely heavy rain. The 3 of us again read/slept in the Cosy Corner for a few hours, and we all went for a surf again about 3:30pm. I hadn't really appriciated this, but the only way to have any freedom and get around here without getting taxis, which are 1) not practical and 2) expensive, is to ride a scooter. It's a really quiet road out the front of the hostel, so Georgie (being 28 and done a lot of time in Asia/India) gave me a scooter lesson. Turns out driving them is vastly easier than using a motor bike like I did in Aus, as there are no gears. The most difficult part will be navigating the traffic, but it's much quieter out here in comparison to Kuta. For dinner the 3 of us went to a really cool little Pizza Resteraunt just up the road, and the food was amazing! I don't think I have eaten anything that hasnt been very very nice since arriving (touch wood!). We got back again about 8pm ish, and were going to go and meet some others at a Cafe/Bar near by, but I was absolutely exhausted and opted to go to bed instead...very tame but I couldn't entertain the thought of a late night.